So you think you know about Watergate? Not only do you not know everything that went on in the Nixon White House, but you are wrong about some of the things you think you know. Gordon Walter sets the record straight. A Nixon confidant so undercover that his name never appears in a single Watergate reference, Walter ends the cover-up once and for all. What did Chicago have to do with the Watergate burglary? What is the real story behind the notorious 18 ½-minute gap in Nixon’s secret tapes? What last-minute event stopped the US from declaring war on Albania? What other behind-the-door strategies were hatched and carried through on or abandoned over the years of Nixon’s presidency? Walter knew because he was there and now you can too. “This book could be classified as “historical fiction” as it is a fictionalized story of a long-time friend of Nixon, one Gordon Walter, going back to their U.S. Naval service during World War II on a remote, somewhat peaceful Pacific island, New Caledonia. This book is a fun read and a page turner. For example, the book opens with a humorous tale of Lt.jg. Nixon, a Navy lawyer, introducing himself during a poker game in the ship’s wardroom. Many politicians are disingenuous, lie, are power hungry, and ego-driven. Nixon was all of these plus he had a huge chip on his shoulder as he perceived himself as an outsider and not one of the privileged classes. Nixon’s emotional makeup pushed him to the paranoia, particularly, during the depth of Watergate. 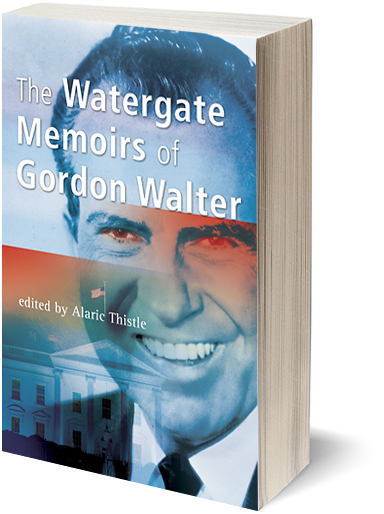 Gordon Walter’s Watergate Memoir captures the sense of the man. “Which of these men is not like the others: Chance, the Gardener? Forrest Gump? Gordon Walter? The answer: Gordon Walter. You have to read THE WATERGATE MEMOIRS OF GORDON WALTER to learn about him because his story hasn’t been made into a movie…yet. Gordon Walter met Richard Nixon while they served together in the Navy in World War II. Walter was one of Lt. Nixon’s few friends, if not the only one, and their relationship lasted, sporadically, for decades. Often many years would pass without any contact. Then Nixon would call Walter because he needed someone to talk to or he needed Walter’s expertise to resolve a problem. Walter was there during most of the most memorable times of Nixon’s career and served as an advisor and assistant in many situations. For several reasons, he did his work so secretly that most people never knew about him. But he knew about them and about Richard Nixon. He tells all. He explains the facts behind Alger Hiss and Whittaker Chambers. How Nixon got the evidence. South America. Who leaked the Pentagon Papers. Daniel Ellsberg. Watergate. Why did the Plumbers break into the Democrat Headquarters at the Watergate. When should the press stop pursuing a story. Spiro Agnew. Both of their opinion of unions. Gordon Liddy. George McGovern. Albania and China. The eighteen and a half minute gap in the tape. These are stories you have never heard before. We read some famous lines, e.g., “Let me make this perfectly clear.” “That would be wrong,” but in a different context. After Nixon’s resignation, Walter wrote a manuscript about Nixon’s government career. He showed it to Alaric Thistle but “was struck by a milk truck early one morning and killed” before he could get it published. Thistle decided to finish the job.